Jeremy Corbyn has been warned Labour will "haemorrhage" votes in the EU election unless the party explicitly backs a further referendum.MEP Richard Corbett, leader of the party in the EU Parliament, told the Observer Labour risked losing out to parties committed to a public vote.If Labour offered "clarity" on a public vote, it would do "very well", he said.Labour's current policy is to keep all options on the table - including pressing for a further EU referendum.It has said it would support a public vote to avoid a "hard Tory Brexit" but several senior figures have expressed concern that a referendum demand would be dropped if the party agreed a Brexit compromise with Tory ministers. Yorkshire and the Humber MEP Mr Corbett told the paper: "If Labour does not re-confirm its support for a confirmatory public vote on any Brexit deal in its manifesto, then it will haemorrhage votes to parties who do have a clear message. "If on the other hand we do offer clarity and a confirmatory ballot we could do very well." 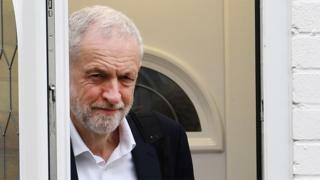 Mr Corbyn has also come under pressure from the SNP's Westminster leader Ian Blackford, who accused him of "wasting time" and avoiding a commitment to a second vote.And former Labour foreign secretary Margaret Beckett told the Observer Labour should give a "clear and simple" message on a confirmatory second referendum.However, others in the shadow cabinet and many backbenchers, particularly in Leave-supporting areas, are opposed to the idea.Meanwhile, talks between senior Labour figures and the government continue over reaching a Brexit deal acceptable to Parliament.On Saturday, No 10 said ministers would meet Labour for "urgent work" to strike a deal in time to avoid EU elections.A Downing Street source said: "If we can keep up the pace of negotiations, we can get a deal over the line and avoid participating in the European Parliamentary elections." After talks on Friday the shadow chancellor John McDonnell said discussions with cabinet ministers David Lidington and Michael Gove had so far been "positive" and "constructive".Parties began gearing up to fight the European elections on 23 May after Theresa May and the EU agreed to postpone Brexit until 31 October.However, the UK can leave earlier - and avoid the polls - if her withdrawal agreement is approved by Parliament in time.Some senior figures within Labour - including shadow Brexit secretary Sir Keir Starmer - are said to be pressing for a confirmatory ballot to be tied to any cross-party Brexit deal.Mrs May has consistently ruled out the possibility of a further referendum and many Conservatives would strongly resist the prospect, described last week by Commons Leader Andrea Leadsom as "appalling".Despite Mr Corbett's warning, and more headlines on Sunday related to anti-Semitism within Labour, reports suggest Mr Corbyn could be in a position to form a government in the event of a snap general election.A poll by Opinium has put Labour seven points up on the Tories.And the Sunday Telegraph said analysis by polling organisation Electoral Calculus suggested the Tories could lose 59 seats at a general election, leaving Labour as the biggest party in the Commons.